Interesting titles include Machete, Catfish, The Tillman Story, Night Catches Us, The Client List, Beverly Hills Chihuahua 2, Skin, The Pregnancy Pact, Welcome to the Rileys, Let Me In, Virus X, Monsters, A Woman, a Gun and a Noodle Shop, and Big Love: Season 4. Amazon Getting Close to Offering Netflix Streaming Competitor? It looks like an Engadget reader was accidentally offered Amazon streaming (image via Engadget), and it's the first proof of the December WSJ story about Amazon bundling a Netflix-like streaming offering with the $79 per year Amazon Prime service. "Your Amazon Prime membership now includes unlimited, commercial-free, instant streaming of 5,000 movies and TV shows at no additional cost." Amazon is one of the few companies that could create a Netflix-like streaming service and compete with Netflix on streaming devices (although Netflix has a huge head start), content (Amazon has deep pockets), and they have a huge number of DVD and IMDB visitors to market the service to. It's also cheaper than Netflix's $7.99 per month plan, so they could grow quickly. What's funny is that both services would be hosted by Amazon's servers. Are you an Amazon Prime subscriber? Would you switch from Netflix streaming to Amazon? Thanks to Jon, John, and Dave for sending this in. Cord Cutting Years Away for "Normal" People? It looks like we have a long way to go before "normal" people will be cutting the cord. Netflix Shares ISP Performance Data - How Would Your Rate Your ISP? 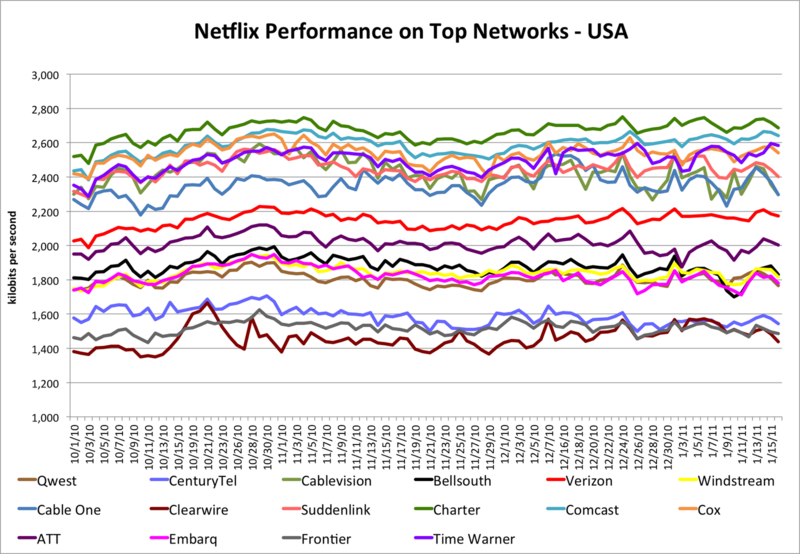 Netflix has 20 million subscriber spread across every major ISP in the US and Canada, and as a result has a lot of information about ISP performance over time. Netflix has posted a detailed comparison of ISP performance on the Netflix Developer Blog (click here for a high-resolution image). In the metric below, we’re filtering for titles that have HD streams available, and for devices capable of playing HD streams (which also filters out mobile networks), to highlight what’s achievable in terms of HD performance on the various ISP networks. As you can see, Charter is in the lead for US streams with an impressive 2667 kilobits per second average over the period. Rogers leads in Canada with a whopping 3020 kbps average. We'll update these charts monthly, and we welcome questions, comments and suggestions to help improve our understanding of Netflix performance on top ISP networks. As Engadget HD notes, Verizon FIOS and DSL numbers are combined, otherwise FIOS would have probably scored high separately. How would your rate your ISP for streaming performance? WSJ: Hulu To Transform into Online Cable Company? The Wall Street Journal reports that Hulu's owners are considering changing the online TV and movie service into an online cable operator. The free online television service has become one of the most-watched online video properties in the U.S. and a top earner of web-video ad dollars since its 2008 launch. But its owners—industry powerhouses NBC Universal, News Corp. and Walt Disney Co.—are increasingly at odds over Hulu's business model. Worried that free Web versions of their biggest TV shows are eating into their traditional business, the owners disagree among themselves, and with Hulu management, on how much of their content should be free. I'm a Hulu Plus subscriber, and while I'm disappointed that most of the free Hulu offerings are not available on TVs through Hulu Plus, I love the huge selection of TV shows and the way Hulu notifies you of new episodes. If Hulu is going to compete with the cable companies, they'll also have to really expand the number of movies they offer. I'm interested in seeing if Hulu's owners can create an online cable company that can compete with the big cable companies (the first à la carte service?). The WSJ article gives some insight into the discussions going on behind the scenes that are reshaping the way we watch TV online, and it'll be interesting to see what they do with Hulu in the next year or so. Do you use Hulu or Hulu Plus? What do you like or dislike about the service? Tristan Louis on TNL.net took a look at the top 50 shows of 2010 and compared availability at Netflix, Amazon, Hulu and iTunes. One of the first inter­est­ing trends to notice is that Hulu Plus seems to offer more recent episodes when it does but Net­flix seems to offer older ones that are not avail­able on Hulu. Often­times, the two offer dif­fer­ent selec­tion on the same show, allow­ing users with sub­scrip­tions to both ser­vices to get wider cov­er­age. Yet, Hulu only offers a bit over one third of all the big rat­ing get­ters last year and Net­flix offers only one out of five of those series on a par­tial basis.Cur­rent sea­sons seem to be a strength area for Hulu Plus and a sub­stan­tial weak­ness for Net­flix. This may be of some sig­nif­i­cance as far as the cord-cutter trend is con­cerned. A ques­tion one could pose here is whether cord-cutters want fresh con­tent or not. If the lat­ter is the case, then Net­flix may pro­vide enough. On the other hand, if cord-cutter expect to be able to get rel­a­tively recent shows on their TV, they will either have to check the Hulu Plus list­ing or pur­chase the episodes on an indi­vid­ual basis. Here's a summary chart, but you should look for your favorite shows in his comprehensive chart. What shows (and season) are you looking for Netflix to stream?